Charleston Harbor and its Approaches. 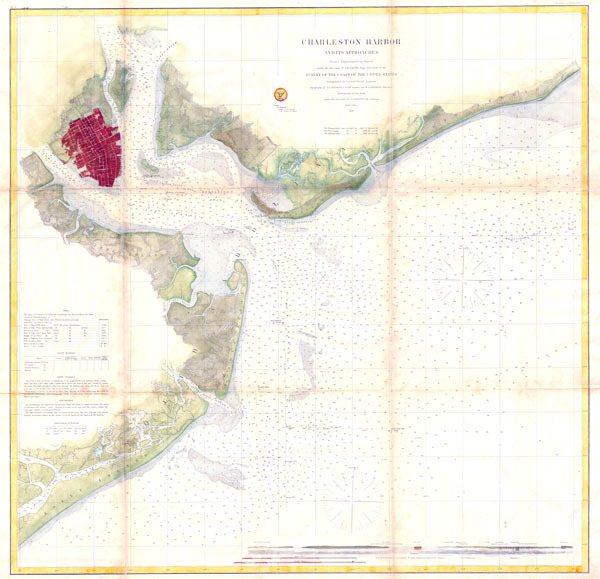 This is of the rarest and earliest obtainable large format depictions of Charleston Harbor and its approaches. Depicts the city of Charleston in a block layout with docks and some commercial buildings located. Places Hog Island, Drum Island, Shutes Folly Island, Morris Island, Sullivan's Island, Long Island and James Island. Indicates, buoys, lighthouses, important channels and includes detailed depth soundings. View of North Channel and Fort Sumter. Details sailing instructions on left hand side of the map. Produced by the U.S. Coast Survey in 1866 (dated) under the direction of A. D. Bache. Very good condition. Discoloration along original folds considerably less pronounced than in image. Fine contemporary hand color.